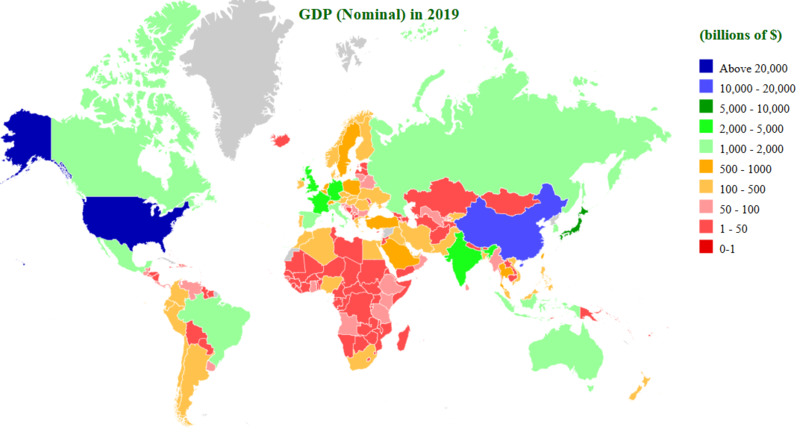 GDP is the total market value of all final goods and services produced in a country in a given year. Each country reports its data in its own currency. To compare the data, each country's statistics must be converted into a common currency. Two methods are used for conversion, nominal and purchasing power parity (PPP). In Nominal method, market exchange rates are used for conversion. 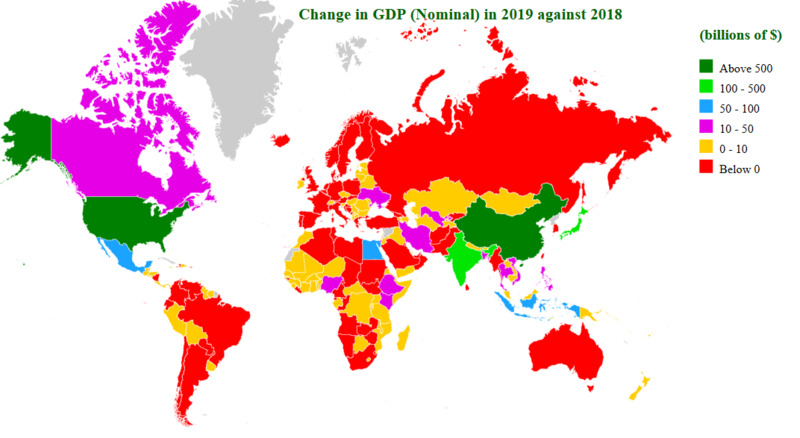 United States remains the largest economy of the world with GDP (Nominal) over $20 trillion in 2018. China, which has surpassed US in ppp methods, is at 2nd place followed by another asian nation Japan. Tuvalu has the world's smallest national economy with a GDP (nominal) of approximately $45 million. In World Factbook estimates, Niue, small island nation in the South Pacific Ocean, is the smallest economy with GDP of $10 mn in year 2003. 16 countries in 2018 have wealth above $1 trillion. Indonesia is latest entry in $1 trillion economy. 64 have above $100 billion and 180 have above $1 billion. Top 20 economies add up to over 80%. 92 smallest economies only contribute 1 % in global gdp and 157 lowest ranked constitute only 10 % of total. Top Gainers in 2018: At current prices, total gdp of world in 2018, has increased by 4,784 billions USD. China is the largest contributor of increment in global GDP. 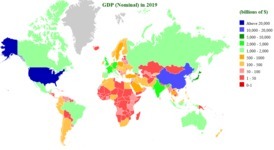 GDP (nominal) of China has increased by $1,443 billion in 2018. United States is second largest contributer with $1,028 billion. Germany, France, and Japan are third, fourth and fifth largest contributer, respectively. 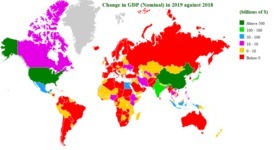 Top Losers in 2018: At current prices, Out of 193 economies estimated by IMF GDP of 14 economies has decreased in 2018 compare to 2017. By shrinking 162 bn dollar, Argentina is the biggest loser followed by Brazil. GDP of Turkey and Venezuela has also declined by over $100 bn. Changes in rank: Libya is highest gainer in World GDP (nominal) Ranking moving up by 10 positions. Rank of Brunei Darussalam has moved up by number 8 and South Sudan is moved up by number 5. Venezuela is the biggest loser in nominal Ranking as its rank is 14 position down. Rank of Sudan is down by 13 place. 114 Afghanistan 21,060 2017 est. 128 Albania 13,000 2017 est. 55 Algeria 175,500 2017 est. 208 American Samoa 658 2016 est. 182 Andorra 2,712 2016 est. 59 Angola 124,000 2017 est. 221 Anguilla 175 2009 est. 195 Antigua and Barbuda 1,535 2017 est. 21 Argentina 619,900 2017 est. 135 Armenia 11,040 2017 est. 183 Aruba 2,516 2009 est. 13 Australia 1,390,000 2017 est. 28 Austria 409,300 2017 est. 95 Azerbaijan 39,210 2017 est. 144 Bahamas,The 9,127 2017 est. 97 Bahrain 33,870 2017 est. 44 Bangladesh 246,600 2017 est. 166 Barbados 4,821 2017 est. 82 Belarus 52,780 2017 est. 25 Belgium 491,700 2017 est. 191 Belize 1,819 2017 est. 142 Benin 9,410 2017 est. 156 Bermuda 6,127 2016 est. 184 Bhutan 2,321 2017 est. 96 Bolivia 37,820 2017 est. 117 Bosnia and Herzegovina 17,460 2017 est. 120 Botswana 16,730 2017 est. 8 Brazil 2,081,000 2017 est. 202 British Virgin Islands 1,028 2017 est. 133 Brunei 11,960 2017 est. 80 Bulgaria 55,950 2017 est. 127 Burkina Faso 13,190 2017 est. 75 Burma 66,970 2017 est. 175 Burundi 3,393 2017 est. 192 Cabo Verde 1,728 2017 est. 112 Cambodia 22,250 2017 est. 99 Cameroon 30,650 2017 est. 10 Canada 1,640,000 2017 est. 185 Cayman Islands 2,250 2008 est. 190 Central African Republic 1,992 2017 est. 141 Chad 9,740 2017 est. 42 Chile 263,200 2017 est. 2 China 11,940,000 2017 est. 39 Colombia 307,500 2017 est. 207 Comoros 659 2017 est. 91 Congo,Democratic Republic of the 40,420 2017 est. 148 Congo,Republic of the 7,799 2017 est. 216 Cook Islands 300 2016 est. 79 Costa Rica 58,910 2017 est. 92 Cote d'Ivoire 39,910 2017 est. 81 Croatia 54,480 2017 est. 67 Cuba 93,790 2017 est. 160 Curacao 5,600 2012 est. 113 Cyprus 21,110 2017 est. 49 Czechia 209,700 2017 est. 36 Denmark 324,100 2017 est. 188 Djibouti 2,082 2017 est. 209 Dominica 608 2017 est. 71 Dominican Republic 74,870 2017 est. 65 Ecuador 100,900 2017 est. 53 Egypt 193,700 2017 est. 103 El Salvador 27,410 2017 est. 138 Equatorial Guinea 10,070 2017 est. 157 Eritrea 6,050 2017 est. 105 Estonia 25,680 2017 est. 171 Eswatini 4,030 2017 est. 69 Ethiopia 79,740 2017 est. 218 Falkland Islands (Islas Malvinas) 206 2015 est. 178 Faroe Islands 2,765 2014 est. 163 Fiji 5,054 2017 est. 43 Finland 252,500 2017 est. 5 France 2,575,000 2017 est. 168 French Polynesia 4,795 2015 est. 125 Gabon 14,470 2017 est. 201 Gambia,The 1,038 2017 est. 176 Gaza Strip 2,938 2014 est. 122 Georgia 15,230 2017 est. 4 Germany 3,652,000 2016 est. 88 Ghana 45,460 2017 est. 189 Gibraltar 2,044 2014 est. 51 Greece 204,300 2017 est. 186 Greenland 2,221 2015 est. 200 Grenada 1,111 2017 est. 159 Guam 5,793 2016 est. 73 Guatemala 70,810 2017 est. 179 Guernsey 2,742 2005 est. 143 Guinea 9,183 2017 est. 197 Guinea-Bissau 1,295 2017 est. 174 Guyana 3,591 2017 est. 146 Haiti 8,360 2017 est. 111 Honduras 22,680 2017 est. 34 Hong Kong 341,400 2017 est. 58 Hungary 132,000 2017 est. 108 Iceland 24,850 2017 est. 7 India 2,439,000 2017 est. 16 Indonesia 923,300 2016 est. 27 Iran 427,700 2017 est. 54 Iraq 192,700 2017 est. 35 Ireland 325,600 2017 est. 152 Isle of Man 6,792 2015 est. 32 Israel 348,000 2017 est. 9 Italy 1,921,000 2017 est. 124 Jamaica 14,720 2017 est. 3 Japan 4,884,000 2017 est. 165 Jersey 4,960 2015 est. 90 Jordan 40,490 2017 est. 57 Kazakhstan 156,200 2017 est. 70 Kenya 78,290 2017 est. 220 Kiribati 186 2017 est. 102 Korea,North 28,000 2013 est. 11 Korea,South 1,530,000 2017 est. 153 Kosovo 6,684 2017 est. 61 Kuwait 118,300 2017 est. 151 Kyrgyzstan 7,061 2017 est. 118 Laos 17,150 2017 est. 100 Latvia 30,180 2017 est. 83 Lebanon 52,700 2017 est. 180 Lesotho 2,721 2017 est. 187 Liberia 2,140 2017 est. 98 Libya 33,310 2017 est. 154 Liechtenstein 6,672 2014 est. 87 Lithuania 46,670 2017 est. 76 Luxembourg 63,520 2017 est. 85 Macau 51,160 2017 est. 134 Macedonia 11,420 2017 est. 136 Madagascar 10,910 2017 est. 161 Malawi 5,433 2016 est. 38 Malaysia 309,900 2017 est. 169 Maldives 4,648 2017 est. 123 Mali 15,000 2017 est. 132 Malta 12,010 2017 est. 219 Marshall Islands 199 2017 est. 164 Mauritania 4,985 2017 est. 131 Mauritius 12,270 2017 est. 15 Mexico 1,142,000 2017 est. 213 Micronesia,Federated States of 329 2017 est. 147 Moldova 8,132 2017 est. 158 Monaco 6,006 2015 est. 137 Mongolia 10,870 2017 est. 170 Montenegro 4,405 2017 est. 62 Morocco 110,700 2017 est. 130 Mozambique 12,350 2017 est. 129 Namibia 12,560 2017 est. 222 Nauru 114 2017 est. 110 Nepal 24,070 2017 est. 18 Netherlands 824,500 2017 est. 140 New Caledonia 9,770 2017 est. 52 New Zealand 200,800 2017 est. 126 Nicaragua 13,690 2017 est. 149 Niger 7,335 2016 est. 29 Nigeria 394,800 2017 est. 199 Northern Mariana Islands 1,242 2016 est. 30 Norway 392,100 2017 est. 72 Oman 71,930 2017 est. 41 Pakistan 278,900 2016 est. 214 Palau 321 2017 est. 78 Panama 59,050 2017 est. 116 Papua New Guinea 20,210 2016 est. 101 Paraguay 28,780 2017 est. 48 Peru 210,000 2017 est. 37 Philippines 313,400 2017 est. 24 Poland 510,000 2017 est. 47 Portugal 211,700 2017 est. 64 Puerto Rico 103,200 2017 est. 56 Qatar 166,300 2017 est. 50 Romania 204,900 2017 est. 12 Russia 1,469,000 2017 est. 145 Rwanda 8,918 2017 est. 203 Saint Kitts and Nevis 939 2017 est. 193 Saint Lucia 1,717 2017 est. 210 Saint Martin 562 2005 est. 217 Saint Pierre and Miquelon 261 2015 est. 206 Saint Vincent and the Grenadines 815 2017 est. 204 Samoa 844 2017 est. 194 San Marino 1,633 2017 est. 212 Sao Tome and Principe 343 2017 est. 19 Saudi Arabia 683,700 2017 est. 121 Senegal 16,060 2017 est. 94 Serbia 39,370 2017 est. 196 Seychelles 1,479 2017 est. 172 Sierra Leone 3,897 2017 est. 40 Singapore 305,800 2017 est. 215 Sint Maarten 304 2014 est. 66 Slovakia 95,000 2017 est. 86 Slovenia 48,080 2017 est. 198 Solomon Islands 1,273 2017 est. 155 Somalia 6,522 2017 est. 33 South Africa 344,100 2017 est. 177 South Sudan 2,915 2017 est. 14 Spain 1,307,000 2017 est. 68 Sri Lanka 83,570 2017 est. 60 Sudan 119,000 2017 est. 173 Suriname 3,665 2017 est. 23 Sweden 541,900 2017 est. 20 Switzerland 680,600 2017 est. 109 Syria 24,600 2014 est. 22 Taiwan 571,500 2017 est. 150 Tajikistan 7,234 2017 est. 84 Tanzania 51,610 2017 est. 26 Thailand 437,800 2017 est. 181 Timor-Leste 2,716 2017 est. 167 Togo 4,797 2017 est. 211 Tonga 437 2017 est. 115 Trinidad and Tobago 20,300 2017 est. 93 Tunisia 39,880 2017 est. 17 Turkey 841,200 2017 est. 89 Turkmenistan 41,670 2017 est. 223 Tuvalu 40 2017 est. 104 Uganda 26,390 2017 est. 63 Ukraine 104,100 2017 est. 31 United Arab Emirates 378,700 2017 est. 6 United Kingdom 2,565,000 2017 est. 1 United States 19,360,000 2017 est. 77 Uruguay 60,270 2017 est. 74 Uzbekistan 67,510 2017 est. 205 Vanuatu 837 2017 est. 46 Venezuela 215,300 2017 est. 45 Vietnam 223,300 2017 est. 162 Virgin Islands 5,182 2016 est. 139 West Bank 9,828 2014 est. 106 Yemen 25,670 2017 est. 107 Zambia 25,580 2017 est. 119 Zimbabwe 17,110 2017 est.